Back in the mid-1990s, Neil Gaiman and British comedian and producer Lenny Henry decided to team up to work on a project for television. Having already conquered the comic book market with Sandman and produced a bestselling novel (Good Omens, with Terry Pratchett), TV was the natural next medium for Gaiman to move into. Henry had come up with the basic idea of 'tribes' of homeless people living in London, but Gaiman carefully refined the idea so as not to make the idea of living rough in London as 'cool' and brought a heavier element of the fantastical into play. The end result was the BBC mini-series Neverwhere, which aired on BBC-2 in late 1996. Neverwhere had a somewhat troubled production. Gaiman had deliberately set the story in London with locations all in easy reach of the BBC studios on the reasoning that they could then use more of the budget for things like effects. In fact, this seems to have encouraged the BBC to simply assign a very low budget to the production. In fact, things were so tight they couldn't even film the series on 35mm, instead producing the series on video with plans to 'filmise' it later. They then couldn't afford to do this. To make matters worse, the sets and scenes had been lighted for film, meaning that many scenes look somewhat overlit and garish on video. This was a huge mistake for the BBC, who had been banking on Gaiman's popularity in the USA to help sell the show, but no US station would touch a series filmed on video with a barge pole. Another problem is the music: the haunting main title theme by Brian Eno is only heard over the end credits, whilst the atmospheric introduction (by long-time Gaiman collaborator Dave McKean) is only accompanied by some ambient sound effects. It doesn't work. Neither do the self-consciously odd 'story so far' sections at the start of each episode. And the least said of the Beast of London sequence, the better. Another problem is that much of the cast was relatively young and inexperienced. Whilst Laura Fraser (Door) has gone on to become a fixture of British cinema and television over the past decade, this was only her third TV part and having to do things like talk to rats and assign dangerous missions to pigeons was obviously not where her talents lay. In other scenes, though, she nails the naive otherworldliness of the part just right. Gary Bakewell is simply not right for the central part of Richard Mayhew. He gets the out-of-his-depth stuff just right but a lot of the time comes across as passive and confused. Part of this is a problem with the character - the later novel version suffers from it as well - but Bakewell's performance does little to enliven things. The series' big find was Paterson Joseph, who gives a splendidly theatrical performance as the Marquis de Carabas, which is appropriate for the role. He perhaps goes a little broad at times, but he steals every scene he's in and his later turn to the dark side (after an encounter with the villains) is very well-played. It falls to the more experienced actors to show the young 'uns how it's done: Hywel Bennett and Clive Russell give deliciously evil performances as Croup and Vandemar, whilst Trevor Peacock's batty Old Bailey and Freddie Jones as the Earl are well-played. There are issues with the script as well. After spending ten years writing comics for DC, you'd expect Gaiman to be a dab hand as a writer, but his script feels clumsy and obvious in some places. In other areas the script shines, with the very careful positioning and timing of events in the first part of the story setting up events later on quite nicely. So, some dodgy acting, some dubious writing problems, some bad music and restricted production values. Does the series get anything right? Certainly. The central storyline remains compelling and the whole notion and idea of London Below (which was so great that China Mieville borrowed from it twice, for his novels King Rat and Un Lun Dun) is superb. How much you enjoy Neverwhere (***) depends on whether you can overcome its numerous shortcomings to appreciate the story. If you can do that, there is much here to enjoy (for this reason, fans of old-school Doctor Who may enjoy it more than most). The complete series is available on DVD in the UK and USA. 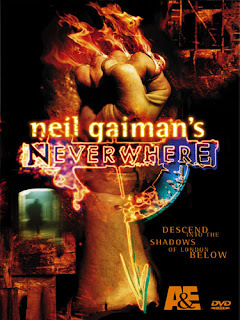 Gaiman adapted the series as a novel, which restores some ideas cut from the TV version, whilst a less-successful comic book version (adapted by others) followed a decade later. A movie version has been mooted for some time, with rumours of renewed interest following the success of the most recent Gaiman adaption, Stardust. Gaiman himself has occasionally spoken about a sequel to the story, most likely in novel form, but nothing has come of it so far. Though this is a really old article, I'd just like to add that the 2013 radio drama adaptation by the BBC was really well done. A rather different cast, but short of remaking the 90s TV series with a better budget, this is probably the closest we'll get to another iteration.